This is Part Seven of my week-long celebration of eggs. I think I can squeeze in one more egg recipe before my kids call the child welfare agency and L follows through with her threat to become a vegan for Lent. As the French say, un oeuf is enough. So, let me push my luck and end where I began, with simply poached eggs, this time richly dressed in a chipotle Hollandaise sauce over a two potato hash with Montreal smoked meat. Trust me, this is the perfect brunch dish – just a little spicy, reminiscent of breakfast but filling enough to carry you through until dinner. But, don’t expect rave reviews from your family if you serve it as Dinner Number Seven in a week-long celebration of eggs. This recipe was inspired by a breakfast I had at the Toronto Four Seasons Studio Café a few months ago and I have been dying to make it ever since. I do not usually eat breakfast and when the food arrived I thought I would never get through it. Before I was finished, I seriously considered licking the plate. Unless you’re an early riser, I would save this dish for brunch; it takes a while. To make my version, I used my mandolin to cut sweet and russet potatoes into even strips, which I then chopped into cubes. I got a thick slice of Montreal smoked meat from a good deli and cut it into matching cubes. Pastrami could easily be substituted for the smoked meat (but, they are not the same thing as is explained here). I blanched the potatoes for a couple of minutes to make sure they cooked through and then sautéed them in a pan with a couple of minced shallots, some chopped red pepper as well as the smoked meat. I stirred in handful of chopped cilantro at the end. 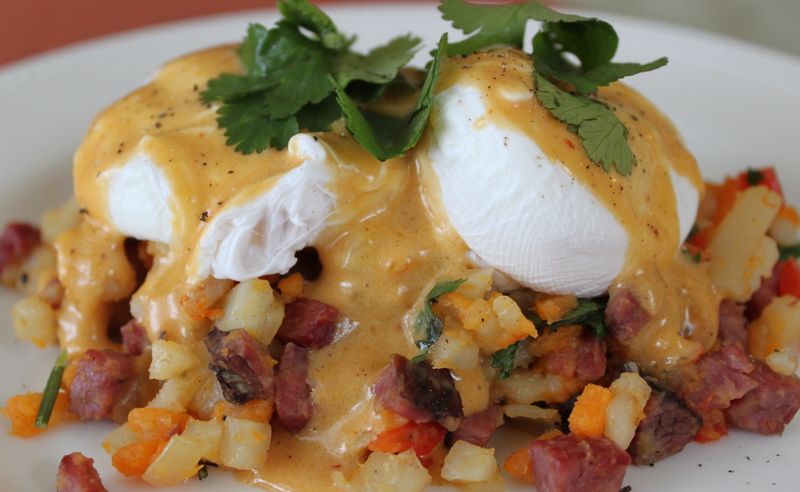 I topped it with two poached eggs, Hollandaise sauce (see below) mixed with my own chipotle sauce . I could tell that even my by-now-egg-averse family to enjoyed it, though they weren’t going to admit it to me. Whip the egg yolks until the foam and add, while still whipping, add Worcestershire sauce, salt, and lemon juice. Transfer to the double boiler, and continue to whip until sauces thickens and forms a ribbon-like stream when you lift the whisk. Remove from the heat and stir in the butter and chipotle sauce. This entry was posted in Breakfast and Brunch, Condiments and Sauces, Eggs and tagged chipotle, eggs, eggs benedict, Hollandaise, Montreal smoked meat, poached eggs, potato, sweet potato. Bookmark the permalink. This is an excellent blog. Photos are terrific. Think I’ll go out Saturday and buy a dozen eggs. Or two. Thanks, Ron, I really appreciate the compliments. I’ve got some eggs in the fridge if you need them – I won’t be getting anyone around here to eat them for a while. Thanks. You won’t get any perplexed looks here. This Rocks! My daughter and I were looking for inspiration this morning and found this; my tummy started singing a happy tune immediately! Nice work, man.